D-DAY: Prime Minister Scott Morrison in Geelong with Sarah Henderson last month. Geelong’s last Liberal MP will lose her seat at the federal election unless the coalition wins in an upset, according to a local analyst. Corangamite MP Sarah Henderson needed her party to win “comfortably” to retain her seat, said senior Deakin University political lecturer Geoffrey Robinson. “She’s really dependent on something extraordinary happening in the campaign to hold onto it,” Dr Robinson said. The assessment comes after Prime Minister Scott Morrison yesterday announced the Federal Election for 18 May. Labor was favourite to win at $1.50 yesterday, compared to the Liberals at $4.50, according to TAB. The betting agency had Corangamite Labor challenger Libby Coker at $1.13 to unseat Ms Henderson ($5.50). But Ms Henderson’s name recognition and profile were high, and recent City Deal and rail pledges made by Mr Morrison could sway voters, Dr Robinson said. Her challenger Ms Coker was a “good candidate” campaigning on “standard Labor themes”, he added. A ReachTEL poll of 856 Corangamite voters last December predicted a 0.03 per cent margin in Labor’s favour, making it potentially the most marginal seat in Australia. In February Sarah Henderson told the Indy she would “fight like no tomorrow” for her seat and warned of “wall-to-wall” Labor MPs. But Labor holding all the region’s electorates was only a “danger” if they were all safe seats, Dr Robinson said. Shadow defence minister Richard Marles would likely have “Bill Shorten’s ear” as a senior minister if he retained the safe seat of Corio and his party won, Dr Robinson said. The coalition could win the election without taking Corangamite if it won key seats in Queensland, Dr Robinson said. But Geelong’s south often got more federal attention than its north due to Corangamite being a marginal seat, he said. Ms Henderson yesterday promoted her party’s focus on jobs growth, the economy, lower taxes and “record funding for roads and rail infrastructure, schools and hospitals“. 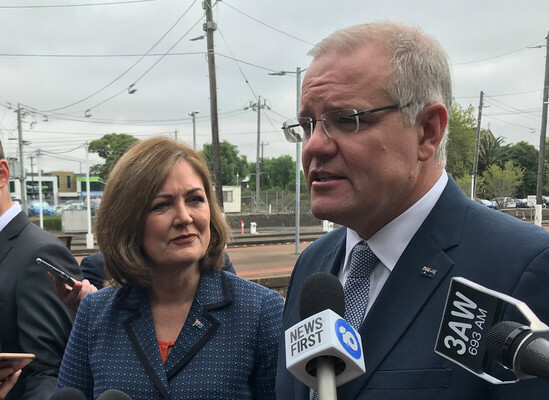 She highlighted more than $2.7 billion for fast rail and duplication in Geelong and funding for a women’s and children’s hospital and children’s emergency department in the Federal Budget. Mr Marles said Labor’s education policies would benefit local schools like at Northern Bay College. He promoted his party’s policies on wages and the expansion of Medicare to slash the cost of cancer treatment.